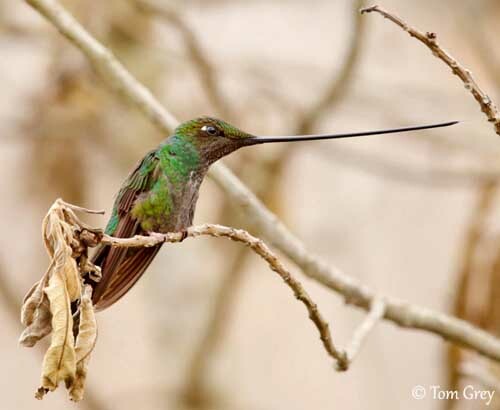 The Sword-billed Hummingbird has the longest bill of any Trochilidae species. It is the only member of the genus Ensifera. This species occurs mainly in wet montane forest at high elevation. The adult male has coppery-bronze head, including the feathers at bill base. It has white postocular spot. The upperparts are dark bronze-green. The forked tail is blackish to bronze-green according to the light. The flight feathers are dark brown to blackish. On the underparts, the throat is blackish. Breast and throat sides are glittering green. The belly is dark grey. The long, straight bill is black, rather heavy and slightly upturned. The eyes are dark brown. Legs and feet are pale pink with black claws. The female has similar upperparts, but the underparts are greyish-white and heavily spotted. The throat is spotted olive, whereas the rest of the underparts are speckled green. The tail is less forked and edged greyish-white. 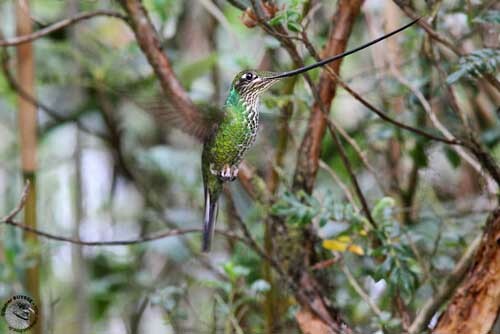 The Sword-billed Hummingbird occurs in all three Andean ranges, from W Venezuela through Colombia, Ecuador and Peru to NE Bolivia. 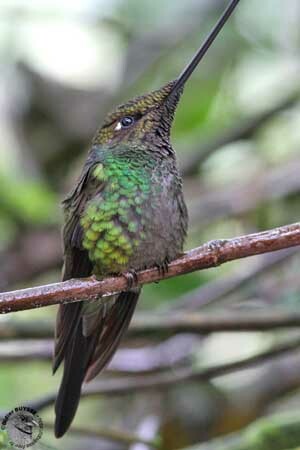 The Sword-billed Hummingbird occurs at high elevation, between 1700 and 3300 metres. It is commonest at 2500-3000 metres. It frequents humid and wet montane forest and edges, shrubby slopes and patches of tall brush in temperate forest. 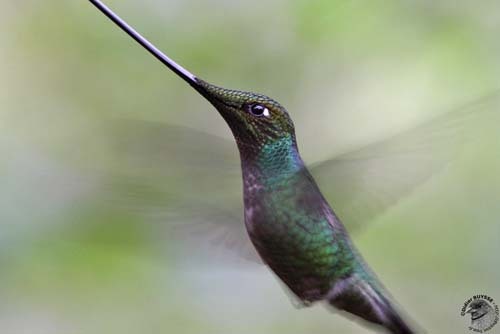 The Sword-billed Hummingbird utters low, guttural “trrr” and short calls. 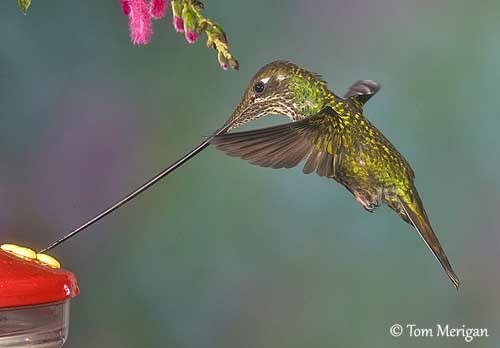 The Sword-billed Hummingbird feeds primarily on nectar from flowers. 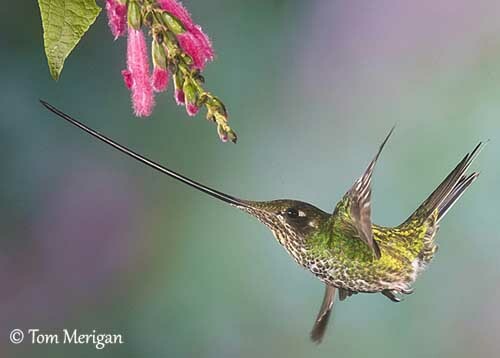 Its very elongated bill and long tongue allow the bird to visit flowers with long pendent corollas. It hovers while licking at the nectar, or sometimes perches below the flowers while feeding. It especially favours Datura and Passiflora flowers. 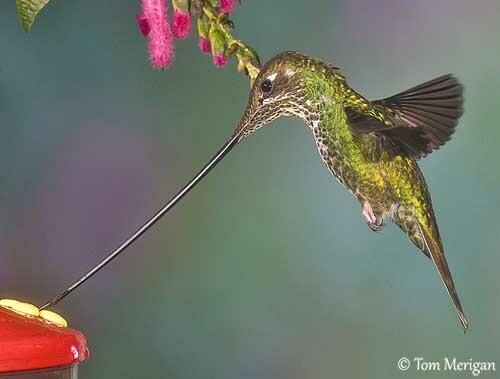 By feeding in this way, the bird assists the plants in the pollination process because these tubular-shaped flowers exclude bees and butterflies. 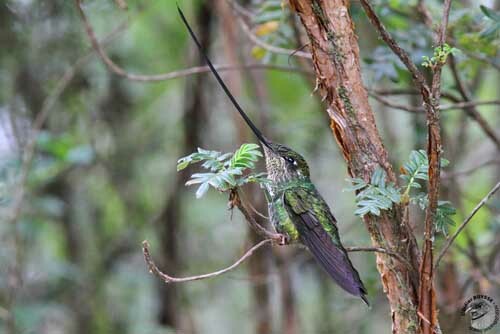 The Sword-billed Hummingbird also takes insects and small spiders, and especially during the breeding season. It hawks insects by flying with wide open bill, and take them from spider webs or from vegetation while hovering. It perches with the bill upwards, held almost vertical, due to this heavy and long tool and to reduce the strain on the neck. The male usually defends a feeding territory, chasing away other males and even large insects which feed on nectar too. It performs aerial and intimidating threat displays and can be very aggressive. During the breeding season, the male performs aerial displays to attract females. The U-shaped flight is performed in front of them. The male may mate with several females and the female does the same. Both sexes separate immediately after copulation. The male does not take part in nesting duties, and the female alone selects and defends the nest-site. 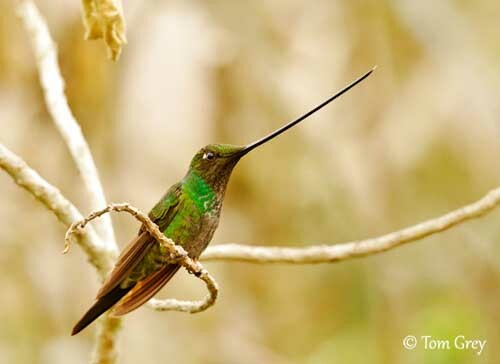 The Sword-billed Hummingbird is sedentary in its range. However, seasonal movements above 3000 metres in Colombia are reported between July and September. Like all Trochilidae species, it hovers in front of flowers when feeding. The wings are beating fast in 8-shaped movements while the tail is cocked. It is very agile in the air and performs beautiful flight displays. The breeding season starts in early spring. 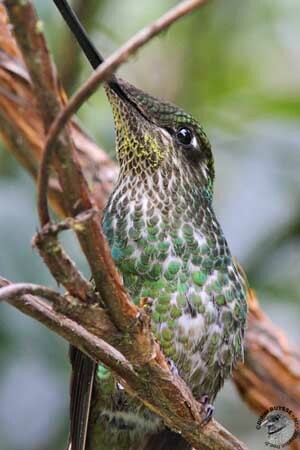 The female chooses a nest-site on thin, horizontal branch in tree, shrub or bush, or in Bromeliad, far from the ground. She builds a cup-shaped nest with woven plant fibres. Green moss is added on the outer part for better camouflage. The inner cup is lined with softer materials such as animal hair, feather down and plant fibres. The structure is strengthened by spider webs. She usually lays two white eggs and incubates alone. She feeds the chicks by regurgitation of partially-digested insects. She pushes the food with her long bill down the throat and directly into the stomach. She broods them during the first week. The chicks leave the nest about 7-10 days after hatching. 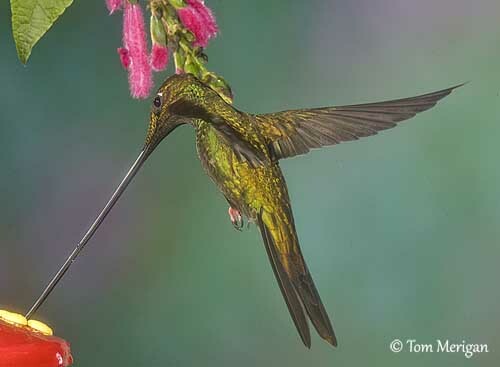 The Sword-billed Hummingbird is common to locally common in its range. It has adapted to man-made habitats which provide flowering gardens with suitable flower species. It occurs in several protected areas and its habitat is fairly protected from heavy deforestation. This species is not currently threatened, and its populations appear stable.